How many times have you enjoyed a 3-mile hike followed by lunch at the trailhead and an afternoon walk through a world-class art museum? Crystal Bridges Museum of American Art, a museum of international fame, offers this possibility. 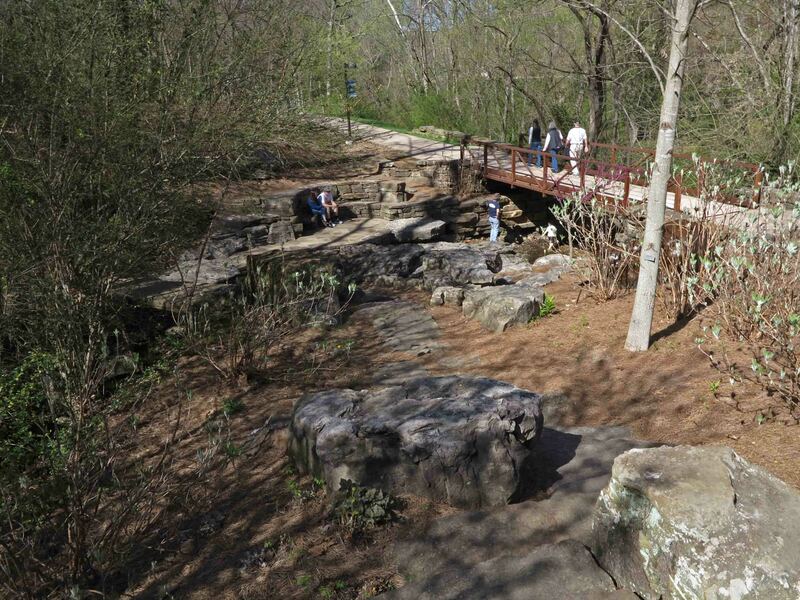 As an added bonus, the trailhead is located in the city of Bentonville, Arkansas, and a mere five minutes from Interstate 49. Crystal Bridges viewed from above. Don’t let the ease of access scare you. 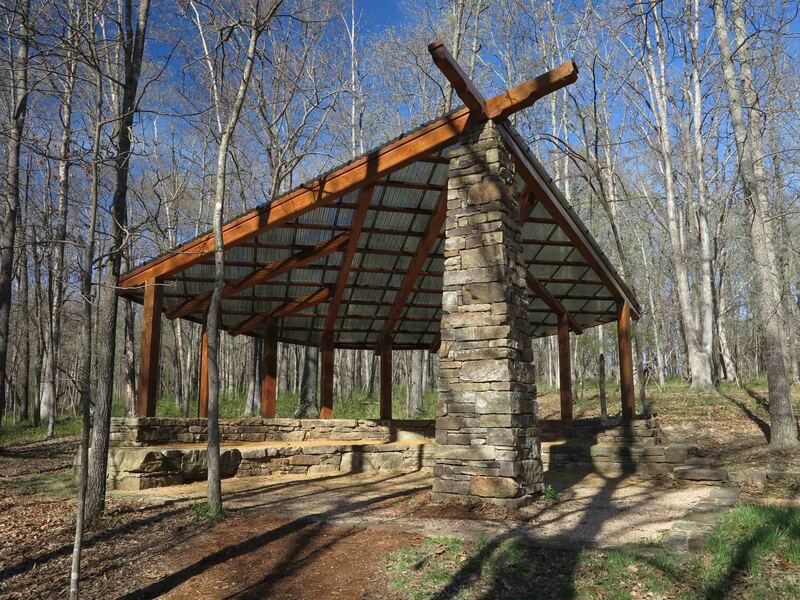 The multi-use trails around Crystal Bridges pass through some beautiful Arkansas woods and offer a true hiking or mountain biking experience. You also have the advantage of customizing your route to fit your mileage needs. 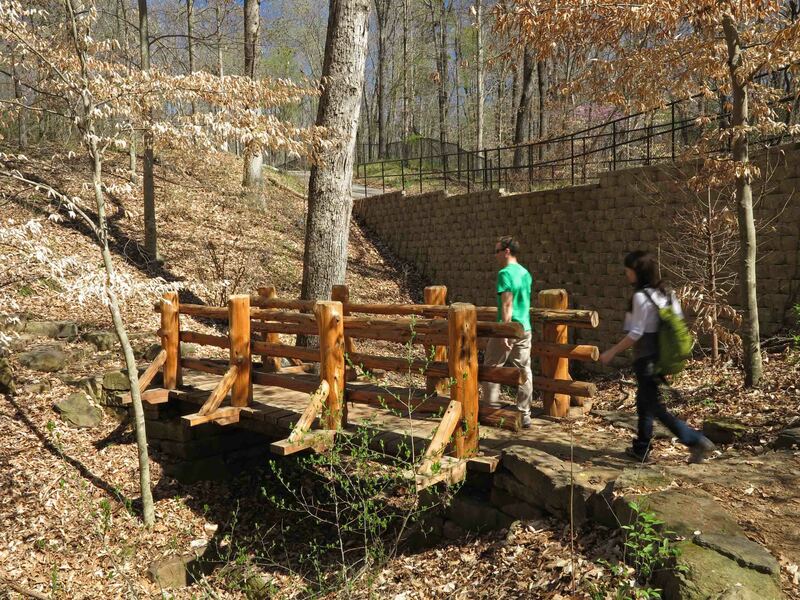 Many visit Crystal Bridges without realizing what the trails have to offer. It’s helpful to view the trails as a continuation of the museum from inside to outside where you’ll find nature’s artwork and occasional sculptures on display. Prior to my hike, I enjoyed plotting my route on the beautiful map offered at the museum. I covered most of the trails, leaving only a section of the Dogwood Trail to add on my next visit. I designated the museum entrance as my “trailhead” since the Orchard Trail begins there and fit well within my route. 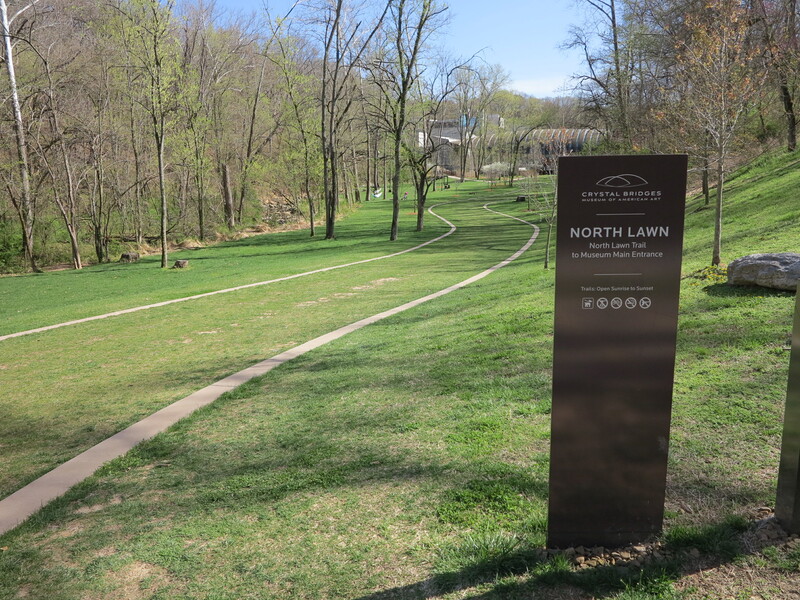 Other locations around the museum provide access to the trails. You will be sharing the trail with many walkers and cyclists, but I found everyone to be courteous in sharing the trail. I also enjoyed hearing various languages and accents as Crystal Bridges attracts visitors from many cultures. Some travel great distances to see the museum. Some trails are paved, and others are a firm gravel surface. All trails are in excellent condition and built to take the heavy traffic. Early in my walk, I crossed Crystal Spring. 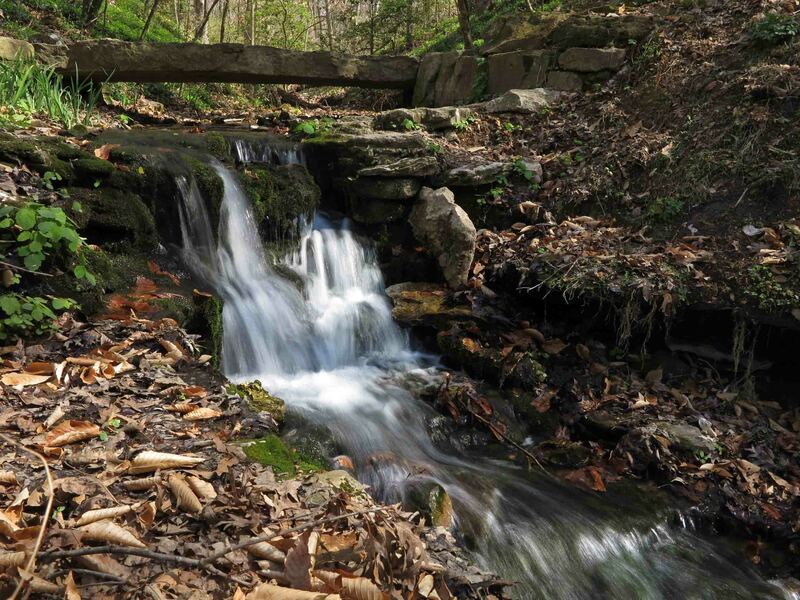 A small stone bridge allows you to walk over the spring. A Frank Lloyd House, (Bachman Wilson House, 1954) has been disassembled and was being reassembled during my visit with an estimated competition date within a few months. This will add a wonderful opportunity for visitors when completed. Crystal Bridges as viewed from the trail. 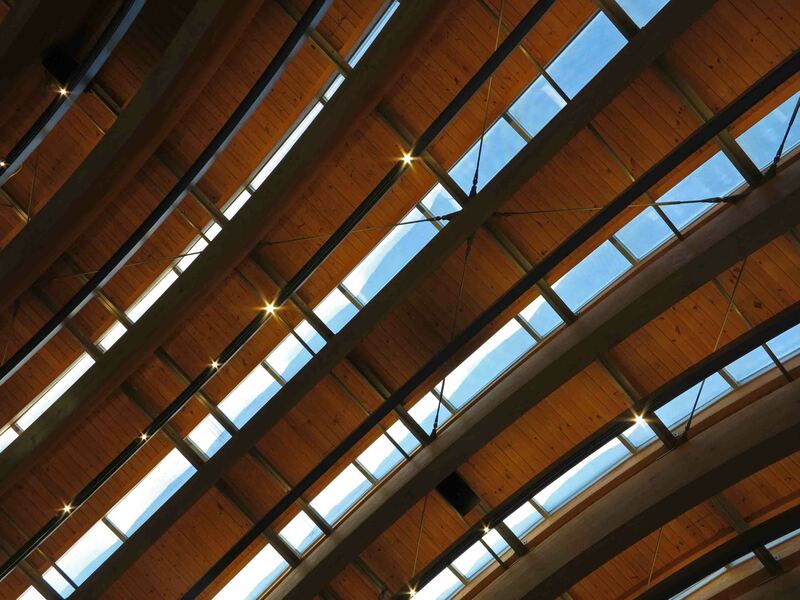 Architecture alone justifies a visit to Chrystal Bridges! 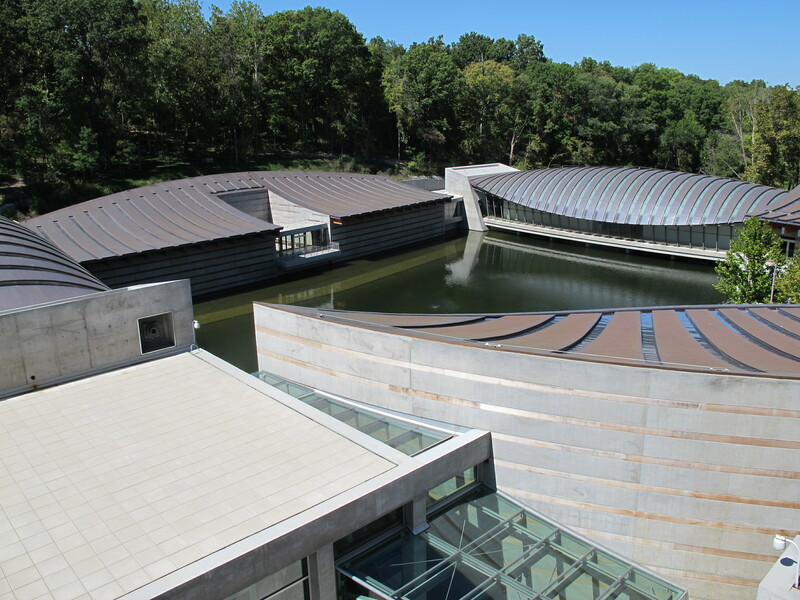 Here’s a view of the museum from an overlook next to the 1-mile Crystal Bridges Trail on the west side of the museum. My route allowed me to loop around the museum and see it from all sides, passing the North Lawn. If I’d had more time, a nap there would be a treat! 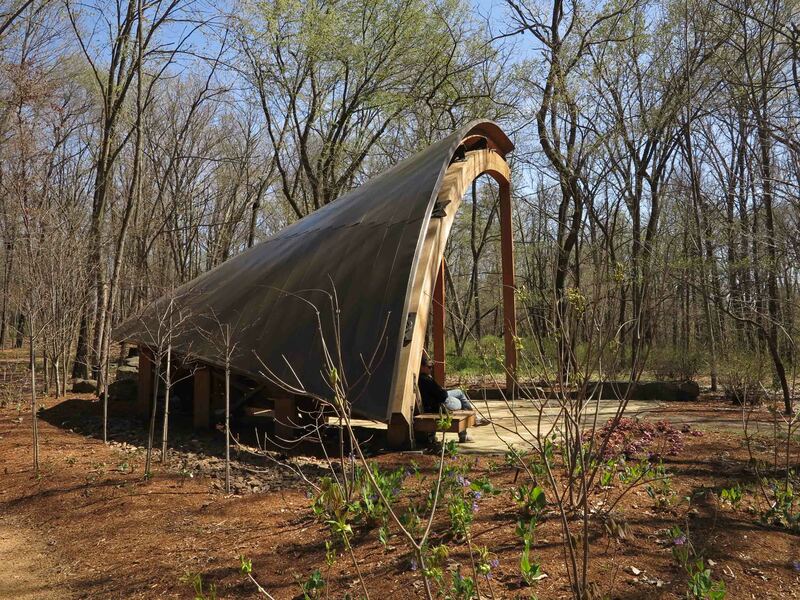 Shelters are functional works of art at Crystal Bridges. Great places to relax and take in the surrounding beauty. My route looped around the east of the museum using the Rock Ledge Trail. This ledge was carved out for a railroad line that was never completed so it makes a nice walking path and only allows foot traffic. I then intersected with the Orchard Trail at the southeast corner of the properties and returned to the museum entrance for a 3.1-mile hike. 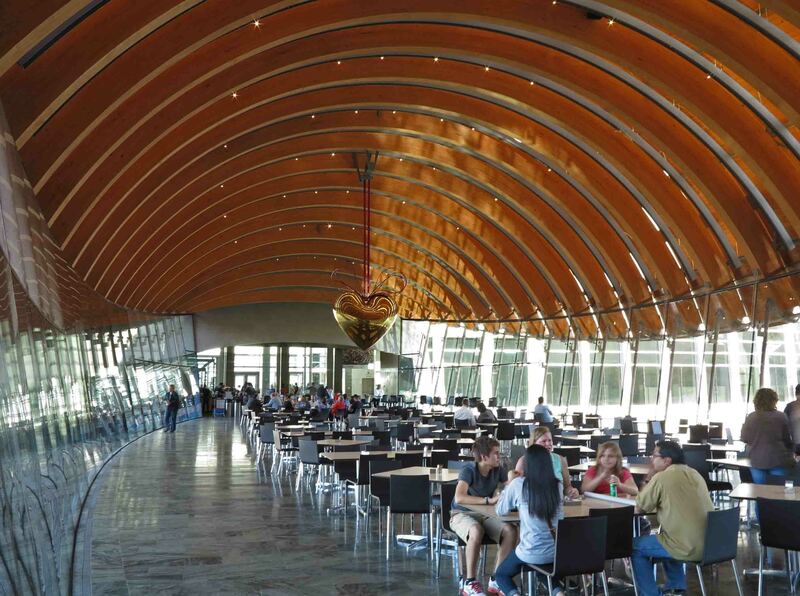 After your hike, you might enjoy an icy glass of tea and sandwich followed by a walk through Crystal Bridges Museum of American Art. Needless to say, I’m looking forward to my next visit! 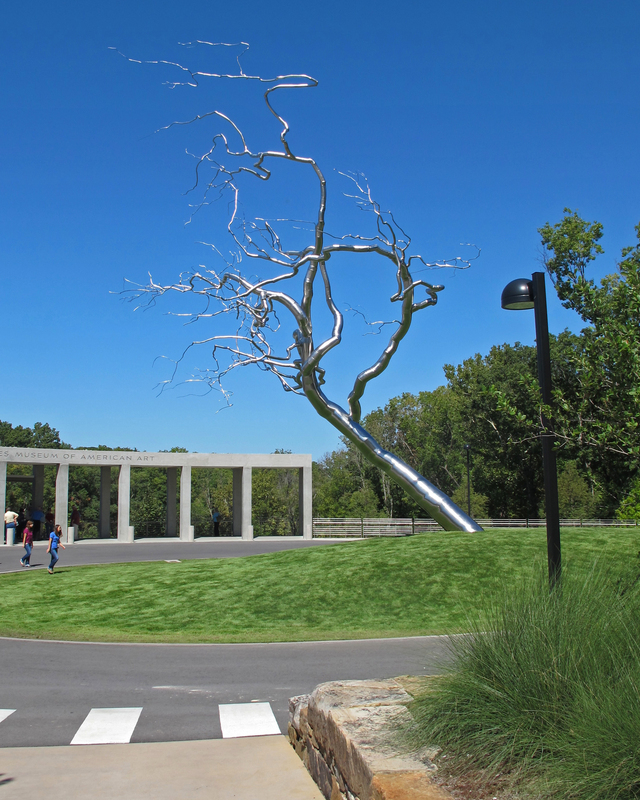 The trails of Crystal Bridges should be on the “must do” list of every Arkansan! 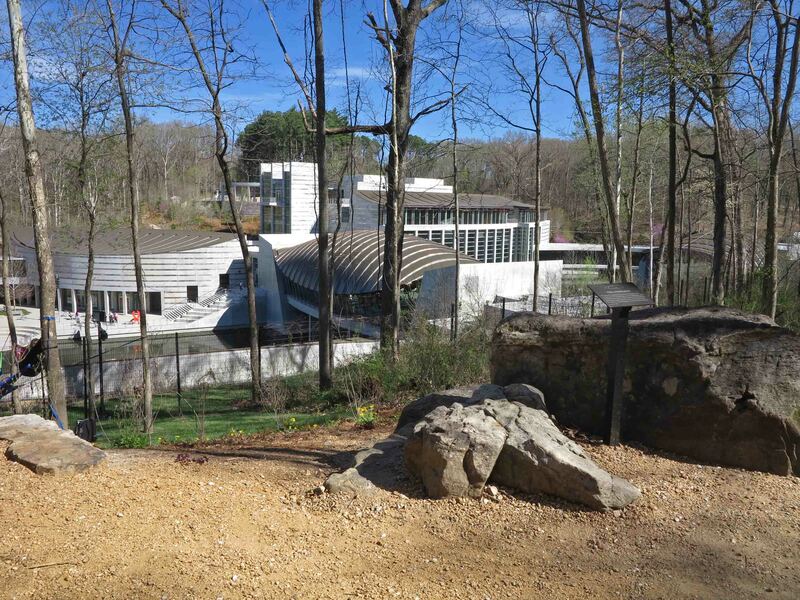 This entry was tagged architecture, Bentonville Arkansas, Crystal Bridges Museum of American Art, Frank Lloyd Wright. Bookmark the permalink. This is an awesome place and a wonderful addition to all the many beautiful things I love about my state. Thanks for posting this. Really beautiful photos of a lovely place!